Four dementia scientists have shared this year’s 1m Euro brain prize for pivotal work that has changed our understanding of Alzheimer’s disease. Profs John Hardy, Bart De Strooper, Michel Goedert, based in the UK, and Prof Christian Haass, from Germany, unpicked key protein changes that lead to this most common type of dementia. On getting the award, Prof Hardy said he hoped new treatments could be found. He is donating some of his prize money to care for Alzheimer’s patients. Much of the drug discovery research that’s done today builds on their pioneering work, looking for ways to stop the build-up of damaging proteins, such as amyloid and tau. Alzheimer’s and other dementias affect 50 million people around the world, and none of the treatments currently available can stop the disease. Prof Hardy’s work includes finding rare, faulty genes linked to Alzheimer’s disease. These genetic errors implicated a build-up of amyloid as the event that kick-starts damage to nerve cells in Alzheimer’s. This idea, known as the amyloid cascade hypothesis, has been central to Alzheimer’s research for nearly 30 years. Together with Prof Haass, who is from the University of Munich, Prof Hardy, who’s now at University College London, then discovered how amyloid production changes in people with rare inherited forms of Alzheimer’s dementia. Prof Goedert’s research at Cambridge University, meanwhile, revealed the importance of another damaging protein, called tau, while Prof De Stooper, who is the new director of the UK Dementia Research Institute at UCL, discovered how genetic errors that alter the activity of proteins called secretases can lead to Alzheimer’s processes. 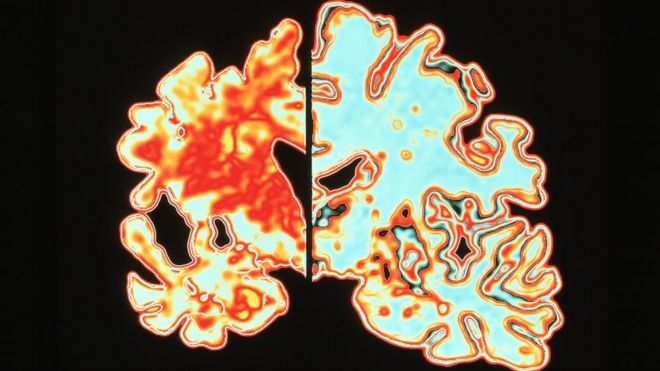 Dr David Reynolds, Chief Scientific Officer at Alzheimer’s Research UK, said: “Our congratulations go to all four of these outstanding scientists whose vital contributions have transformed our understanding of the complex causes of Alzheimer’s disease. 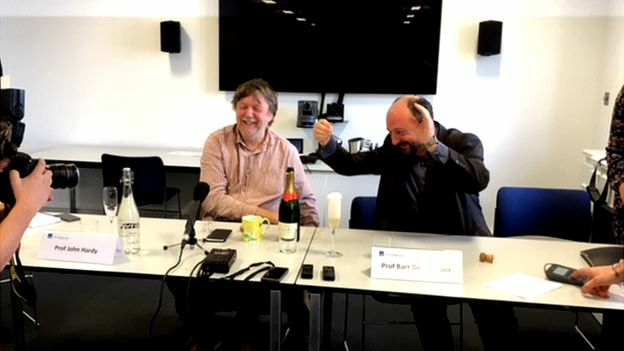 Prof Hardy said he would be donating around 5,000 euros of his share of the 1m euros from the Lundbeck Foundation to help campaigns to keep Britain in the EU, and called Brexit a “unmitigated disaster” for scientific research. He also pledged his thanks to all the people with Alzheimer’s who, over the years, have volunteered to help with dementia research. This entry was posted in Britain, Europe, Health, History, Science, World and tagged Germany, Lundbeck Foundation, Prof Hardy, UK by rolyred. Bookmark the permalink.